Armed, murderous, militarised, partisan, powerful, unaccountable, uneducated: this is how many in and even outside Burundi describe the Imbonerakure, the youth wing of the ruling party. It, however, dismisses such accusations as opposition propaganda. Since the governing CNDD-FDD party chose Nkurunziza as its candidate on Saturday, thousands have taken to the streets of the capital Bujumbura and other towns to protest, on the grounds that it violates a constitutional two-term limit. The ruling party insists Nkurunziza’s first term doesn’t count because he was appointed by parliament, not elected by the people. As a heavy military and police presence engulfs the capital, The Red Cross says six demonstrators have been killed in violent clashes with the police. Burundi’s security forces say only two have died while 37 police officers have been injured. On Sunday, the ruling party announced on Facebook that two members of the Imbonerakure had been shot dead during the protests. The party’s decision, the ensuing unrest and ongoing exodus to Rwanda and the Democratic Republic of Congo (DRC) are ramping up international fears that efforts to consolidate peace since the end of Burundi’s 1993-2005 civil war – in which Nkurunziza was a prominent rebel leader – could be undone. The 12-year conflict, which followed the assassination of Burundi’s first democratically elected president, Melchior Ndadaye, saw an estimated 300,000 Burundians killed. 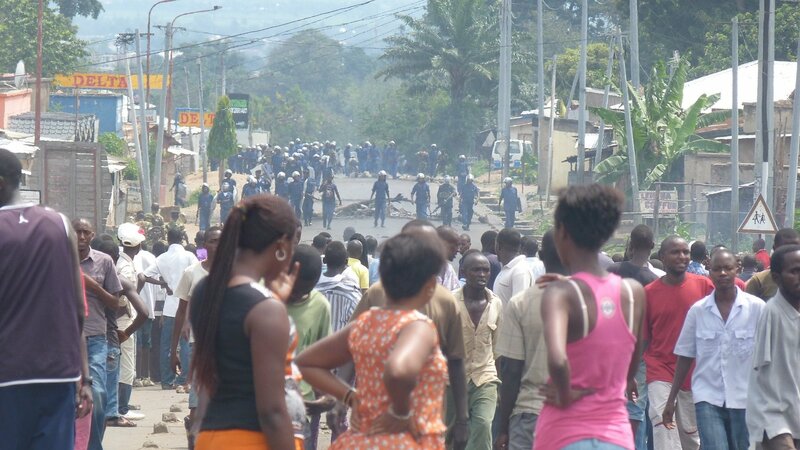 Reports are rife that the Imbonerakure have, sometimes in police uniform, attacked protestors with clubs and machetes and even grenades. Human rights groups have repeatedly raised concerns that the youth wing is doing the ruling party’s dirty work and has become virtually a law unto itself. The word Imbonerakure means “those who see far” in the Kurundi language. The group arose in 2010 out of disarmed fighters from the ruling party’s previous incarnation as a rebel group who never fully demobilised. “Former members of the CNDD-FDD never completely left the mentality of war to fully rejoin fully civilian life,” Burundi rights activist Vital Nshimiyimana told IRIN. Leading Burundian peace activist Jean Claude Nkundwa said years spent fighting in the bush made youths joining Imbonerakure vulnerable to exploitation by politicians. “Some of them are promised jobs which they will never get because they are not educated anyway,” he told IRIN. The Imbonerakure has some 50,000 members across the country, according to Pierre-Claver Mbonimpa, Burundi’s most prominent human rights activist, who spent months in custody last year and still faces a charge of endangering state security after publicly stating that the Imbonerakure were receiving military training in the DRC. Mbonimpa has not been heard of since Monday, when he was reportedly picked up in Bujumbura by unknown individuals driving a car with tinted windows. Reports that army officers have distributed guns to the Imbonerakure have circulated – and been vehemently denied by the government – for at least a year. In early April 2014, the United Nations mission in Burundi cabled headquarters in New York, citing credible reports that both weapons and uniforms were being distributed. In many rural areas, the Imbonerakure acts “in collusion with local authorities and with total impunity,” behaving as a “militia over and above the police, the army, and the judiciary,” the cable said. The cable was met with an exhaustive denial from the government, but testimony to the contrary continues to raise alarm. “In some rural areas, they have taken the work of security like police yet they are civilians,” Jean-Paul Kayinamura, a trader from the northwestern town of Cibitoke, told IRIN recently. Earlier this year, Mbonimpa accused the Imbonerakure and the police of committing 37 extra-judicial killings in Cibitoke province following a battle between security forces and an as-yet-unidentified armed group. "In several corners of the country, these youths rule the roost"
In a 2015 report, the Observatory of Government Action, a group of civil society organisations, said the Imbonerakure “want to substitute themselves for the security forces…. They detain people with different political opinions, tie them up, beat them, make them pay fines and so on. “They set up barricades, destroy the emblems of other political parties, do the rounds at night and even obstruct the meetings of other parties. “In several corners of the country, these youths rule the roost. Violent clashes with youths of other parties have come close to degenerating, sometimes to the indifference of authorities,” the report said. *This report was corrected on April 29. The 37 policemen were injured, not killed. UPDATE: Rights activist Pierre-Claver Mbonimpa was released from custody on April 28.